Children learn and grow in faith at FPCA. From leading the worship service on the Children’s Sabbath to making new friends at Vacation Bible School. Gather, sing, play, pray, and grow in God's love! 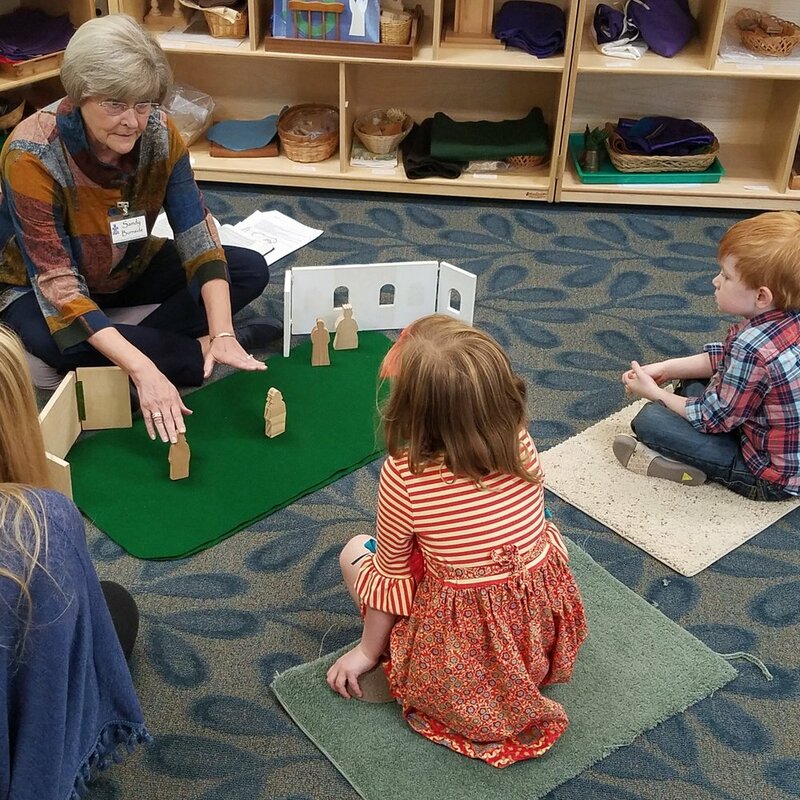 Each week children will discover God's stories through play, allowing them to experience faith the way they learn best. Check our calendar for upcoming events or ask us about our programs! Children join their families in worship. Here, children actively participate in setting the communion table, pouring the water, taking communion, and welcoming new members of our family through baptisms. Children ages 3 through kindergarten may go to Godly Play after the children’s message. In Godly Play, children discover the stories of God and Jesus and are encouraged to respond through art and creative play. Maracas, bells, chimes, and voices … children make a joyful noise. Children sing in church, at concerts, the Christmas pageant and more while learning the importance of songs of praise in worship. See opportunities to explore God’s love through our music program for children. Check-in your youngest and even these little ones will see, hear, and experience God’s love. Our nursery is a cheery place to leave your children while you take time to worship, pray, and learn. Childcare is available from 8:45 a.m. to 12:30 p.m. on Sundays, during the Mom’s Group and at many all-church events. Meet a friend at our turquoise table for a snow cone. Pick a book from our Little Free Library. Bring your parent to the playground on a Saturday afternoon. Walk the labyrinth with your mom and dad and learn about quiet spaces. Play with friends in the nursery while your mom goes to Mom’s group each Wednesday. We’ve camped out, painted God’s great gallery, shared God’s light, kayaked down a rolling river, and been super heroes for Jesus. Vacation Bible School through energizing music,fun drama and bible stories, and reflects the lessons through art, song and exercise! It teaches God’s love to kid’s and volunteers alike. 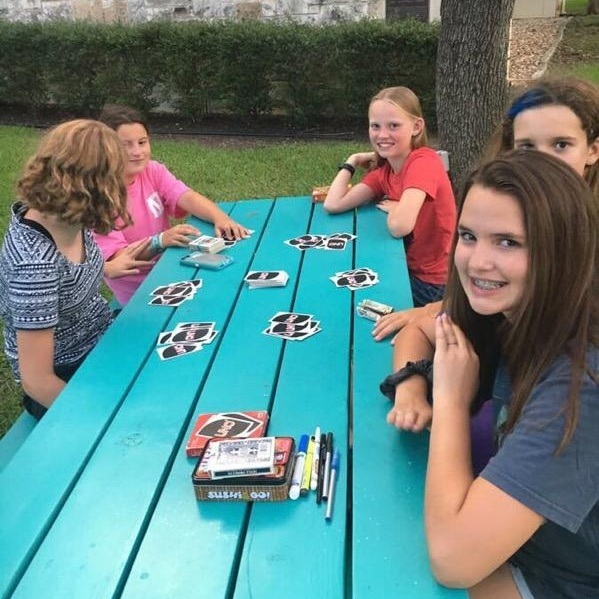 VBS is a blast for preschoolers through elementary ages while tweens join the fun with our service squad by hiking and doing service projects in the local community. It’s an all-church affair with decorating, welcoming, feeding, leading, praying, singing, and storytelling. Serving as Christ’s hands extends from the oldest to the youngest. Sip cool lemonade at a stand to support hurricane victims, gather together to stuff hygiene bags and build flood cleanup buckets, or bring in a pair of socks to support the kids’ sock drive for the homeless. We sing Christmas carols to support our senior friends at a local retirement center and walk together at Camp Mabry to help fight hunger in our community. At First, you are never too young to serve together and we never run out of opportunities. Kids extend Christ’s message to love one another and invite our community to share in fun activities like a spooktacular Trunk-or-Treat afternoon complete with a costume parade! Or join in an Easter egg extravaganza and come hunt thousands of eggs on the Saturday before Easter Sunday. Pancake breakfast, parades with palms, and popsicles on the playground. There is always a friend to play with and a way to share God’s love.